Elizabeth Diane Givens was born on April 1, 1952 in Elizabeth, New Jersey, daughter of the late Fred Givens and Vivian Claiborne Givens. She attended Linden Public School system and graduated from Linden High School, Class of 1970. Elizabeth has lived in Roselle for 20 years. Elizabeth was a dedicated employee of the Linden Board of Education for 39 years and was employed as the Main Office Secretary for Joseph E. Soehl Middle School for 38 years. She was recognized in May of 2018 for over 35 years of dedicated service. During her years at Soehl, Elizabeth was admired by many students, faculty and staff and will sorely be missed. She was a member of a local bowling league at Linden Lanes for 32 years. Elizabeth was also an avid fan of the New England Patriots. On Monday, April 8, 2019, Elizabeth Diane Givens entered into eternal rest at the Center of Hope Hospice in Scotch Plains for a month long battle with cancer. She was predeceased by her brother, Fred Givens II and sister, Janice Vinson. Elizabeth leaves to cherish precious memories, her son, Steven Givens; three brothers: Robert Givens, Darrell Spencer (Armineh) and Jeffrey Spencer Givens (Patricia); two nieces: Vicki Davis and Alexis Cartagena; five nephews: Mark Vinson, Baron Vinson, Fred Givens III, Eric Givens and Brandon Taylor Givens; great niece, Lakish Davis; and a host of great-great, great-great-great-nieces and nephews; and good friends: Denice Givens Patterson, Diane Griffin and Beatrice Jackson. To send flowers or a remembrance gift to the family of Elizabeth Diane Givens, please visit our Tribute Store. 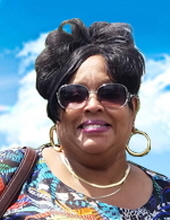 "Email Address" would like to share the life celebration of Elizabeth Diane Givens. Click on the "link" to go to share a favorite memory or leave a condolence message for the family.